Simply choose the loan for you ON THE RESULTS PAGE TO FOLLOW. It's the most wonderful time of the year but also, unfortunately, the most expensive. The key to managing your money during the festive period is to budget effectively, and start saving in advance. Our Christmas Budget Planner covers the main costs of Christmas, to help you budget for the perfect day. Complete all fields that apply to you to see your total Christmas budget. We've estimated costs based on average at major retailers, but you can edit these fields if you know a more accurate cost for you. How many people are you hosting for Christmas Dinner? Eating other meat / veggie? How many people will be drinking? Will you be buying a Christmas tree? Will you be buying decorations? How many people will you be buying gifts for? What is your average budget per person? How many extras do you need to buy? How many Christmas parties will you attend? What is your budget per party for? How many new outfits will you buy? How many miles do you need to travel to visit friends and family? for more #ChristmasBudgeting tips and gift ideas in the run up to Christmas! So now you know how much you need to save each week to afford your perfect Christmas, but how can you put this money aside when you have everything else to pay for? Here’s some easy things you can do to help you save each week. Identify a pricey luxury that you could swap for an own-brand for a few weeks and save the difference. Or why not try a family challenge to give up takeaways, bacon, cheese, or dessert for a month. Both your health and your bank account will thank you! Stopping drinking for a month can save you around £65, and smokers save an average of £250 by quitting for a month! Whichever your vice, take advantage of the support of all the other people taking part in these challenges over the month. Food prices rocket as soon as the Christmas packaging comes out in supermarkets. Take advantage of deals now by buying early and freezing food. For even bigger savings, note what time your supermarket gets the yellow stickers out and freeze the reduced items at the end of the day. The Royal Mail gets busier and busier in the run up to Christmas, so their guaranteed pre Christmas delivery dates are much earlier than you would expect, especially for abroad. Make sure to check their site to find the latest dates that you can still post your cards by the cheapest services. Budget stores like Poundland get the majority of their stock from Chinese wholesalers. These wholesalers also put their products on AliExpress.com and Ebay.co.uk, so if you go direct to these sites you can pick up what you need for even cheaper. Children's costumes for Halloween or Christmas parties are always marked up around this time of year. See if another parent could just swap last year's outfit with yours, that way both children have a new outfit, but no money has been spent! Don't panic about having to spend a lot of money on someone who seems to have everything, there are lots of great charity gifts to fit any budget that anyone would love. Take a look through this guide from Money Saving Expert for inspiration. Train tickets are released 12 weeks in advance online, and are cheapest 10 weeks in advance. 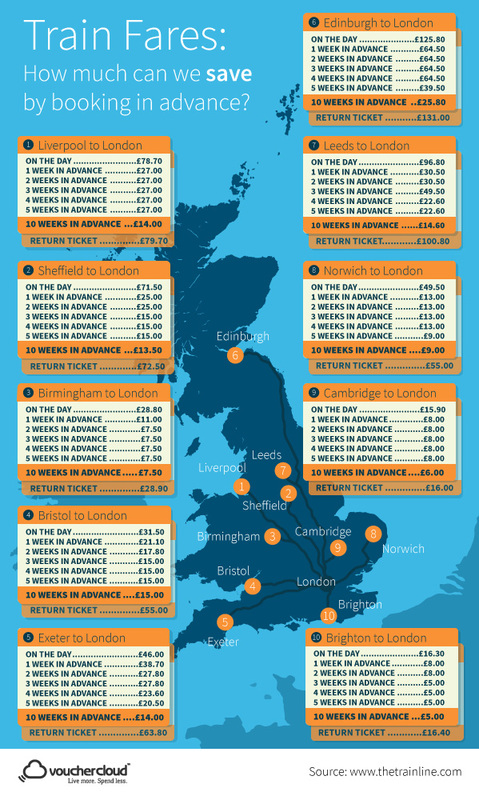 For longer distances like Leeds to London, you could save up to £80! Take a look at this infographic from Trainline and VoucherCloud to see the difference in cost. Winter fuel bills can hit you hard when you're used to summer prices. Look out for the article on our blog page on how to keep the warmth in your home for free, and how to make sure you're on the cheapest energy tarif. Instead of buying a gift for everyone in a group, why not suggest a Secret Santa? It adds a fun dynamic to the gift giving process and saves everyone money. Plus, with everyone able to spend slightly more, everyone gets a nicer gift – including you! Black Friday can be the savvy shopper's dream, or the unprepared shopper's nightmare! Make sure you have a plan and are looking for discounts on specific products. Don't get sucked in by huge reductions on brands you would never buy! Look out for our Ultimate Black Friday Guide in our blogs page. We've been on the hunt for the highest quality DIY gifts, that are really cheap to make and require zero technical crafting ability (luckily for us!). Pinterest is a great place to start if you're looking yourself. Otherwise look out for our blog on the best DIY alternatives to high street gifts. Morrisons offer free wine glass rental (with a small deposit) when you buy 6 bottles or more. So, don't buy extras just for a dinner or party if you won't use them regularly. If you're posting parcels or gifts that weigh over 2kg, Royal Mail is a really expensive option. Take a look online for cheap personal couriers who can deliver for less – some will even collect the parcel from your house. There are plenty of ways to suss out the best restaurant deals if you're going for a meal with friends or colleagues, including websites and apps. Look out for our blog post "Tips for Eating Out on a Budget" for our rundown of the best ways to find a deal. We love these Christmas Cheques from Money Saving Expert. If you're looking for top up gifts for your loved ones, why not give them a cheque promising a night of babysitting, all the cooking for a week, or a 30 minute massage? The possibilities are endless and you'll end up with a really personal gift. What better gift that a personalised video from Santa? A few websites offer this but our favourite is Portable North Pole. There's also some great Santa trackers available from Christmas eve. We like this one which includes loads of mini videos and great facts to keep them occupied. Okay so this final tip isn't necessarily a money saver, but it's free and will surely occupy the kids for a few precious minutes. Got any other Christmas Money Saving Tips? Let us know on Facebook! © Copyright Aspire Money © 2019 Aspire Money Limited. Registered in England No 06457376, which is authorised and regulated by the Financial Conduct Authority (FCA FRN 681346). DPA Licence Number: Z1262766.